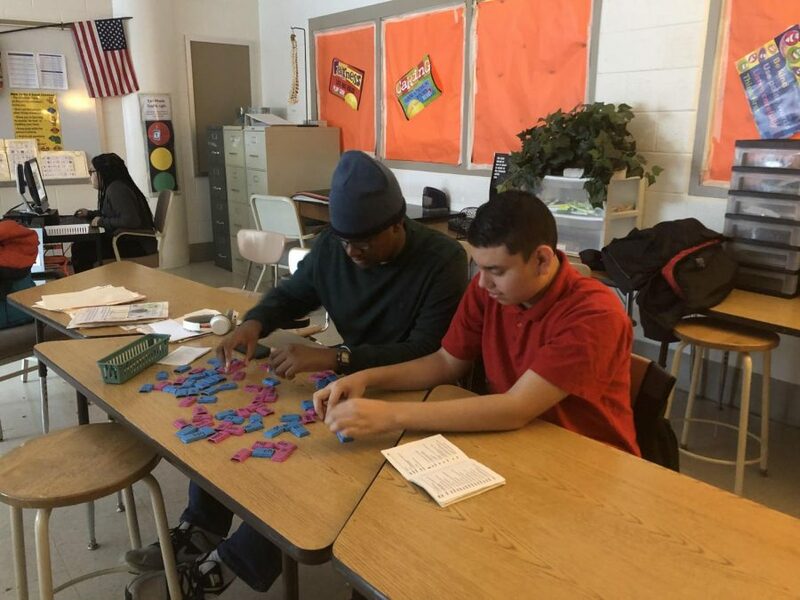 Freshman Kevin Mensah and sophomore Frank Castro practice sorting as part of the transition program to help them gain job experience for life after high school. Watkins Mill High School now offers a program to help students in the Learning for Independence and Autism Resource Services programs figure out a plan for what they want to do with their lives after high school. There are around 30 students in this program. Any student in the Learning for Independence or Autism Resource Services program has access to it. The majority of students who go out to get jobs are ones in their last year and in the ARS program. “No matter what we do in the community, we try to mimic it so that there’s a room upstairs and we can teach them any of the skills that they need to learn before they go out,” Silver added. They also have sites in the community created to help the students follow certain steps. “There are different things for them to put together, so each site we have in the community, we have a pet store and a fish tank so they can feed fish here,” Silver said. This program is done by a whole team of educators: Silver, Casey Burdette, Kerry Krammer (who runs the work program for ARS), Gloria Makosy (who runs the work program for LFI), Lois Parris, Kauri Martin, Paramita Lubis, George Bright, and Theresa Wheeler, who are all LFI and ARS paraeducators who take students out to work.